Here in Canada, we celebrate anti-bullying day in February. Everyone wears a pink shirt to symbolize that we won't tolerate bullying. Here's a great video that explains everything in kid-friendly language. Pink Shirt Day began in Nova Scotia when a ninth grade boy wore a pink shirt on the first day of school. After he was bullied for his choice, two other boys went out and purchased pink shirts for their classmates to wear. Yesterday, my third graders worked in groups of four or five students to write poems from the point of view of the Bully, Bullied, and Upstander. We borrowed this idea from Jen Runde of the blog Runde's Room but chose to focus on Upstanders, rather than Bystanders. 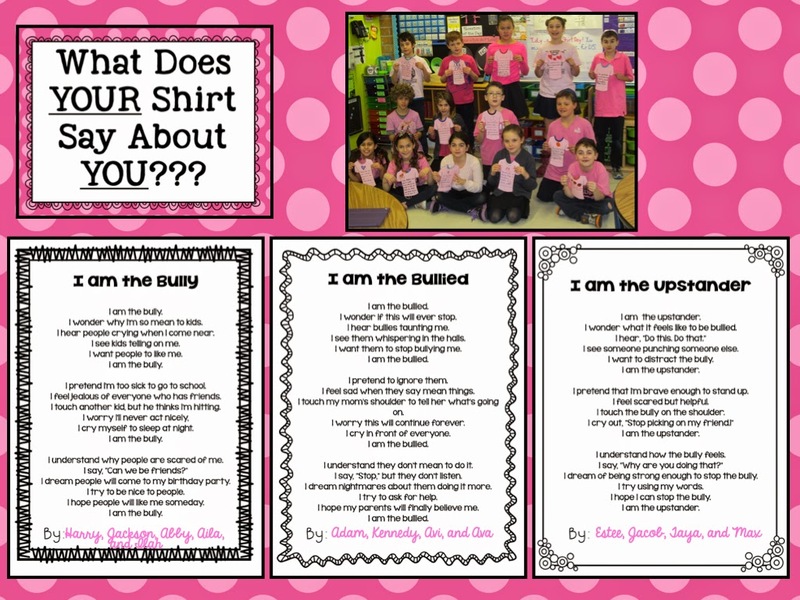 We also searched online for anti-bullying quotes and copied them onto pink t-shirt templates. I leave you with one question: How Would YOU like to be remembered?